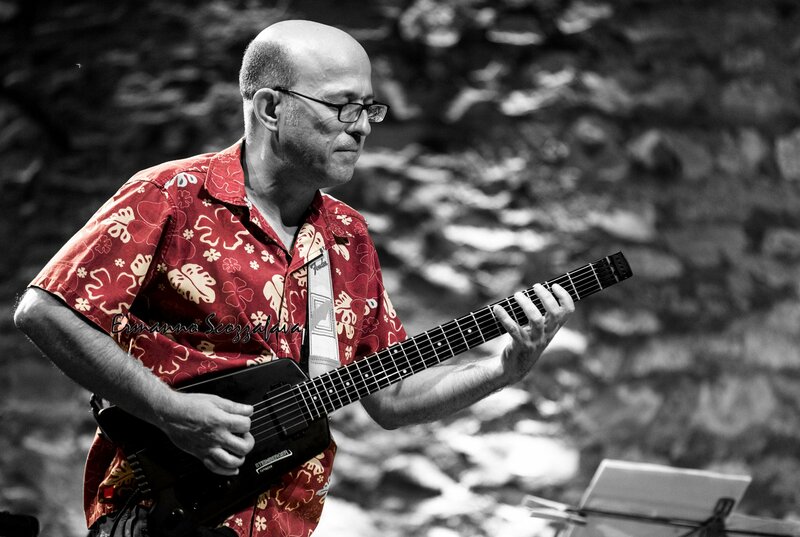 Guitarist, improviser, composer, conductor. From the early 90’ he has taken part in various groups and has accompanied many Italian jazzmen always attendeding also contemporary music, music for theatre and ballet, folk music, happenings and improvisations with poets and with painters. With his groups he has recorded a dozen of CDs very well reviewed by the specialised press all over the world and he has played everywhere in Europe and often in Japan, Indonesia, Latin America, Northern Africa. Nowadays, after closing the eight-years experience of the TUBATRIO - his own group with Giancarlo Schiaffini(trombone/tuba/electronics) and Ettore Fioravanti (drums) -, he continues to play all around the world in the humoristic duet born in 1997 with Carlo Actis Dato with whom he has also created a quartet with tuba and drums (début at “Jazz à Carthage 2009”, Tunisia). From 2005 he leads a trio in France with Frédéric Monino (bass) and Bruno Tocanne (drums) purchased by the “Cri du Port” of Marseille and a project in Latin America, “Spaghetti Jazz”, born in Argentina in 2000 with the collaboration of musicians like Rodrigo Dominguez and Pablo Ledesma. In Janyuary 2004 a duo with the Scottish drummer Tom Bancroft was born thanks to the suggestion of the director of the Edinburgh Jazz Festival (concerts in some important festivals in UK: Edinburgh, Manchester, Cheltenham, etc.). From 1998 Rocco is a regular partner of some important English improvisers like Veryan Weston, Lol Coxhill (cd “London Gigs”) and others. He collaborated in Italy with Peter Kowald, in Belgium with André Goudbeek, and has partecipated to the Italian conductions of Butch Morris. Definitely he regularly meets a lot of musicians around the world. He often visits Japan and collaborates with the Italian Cultural Institute in Buenos Aires and with a couple of Argentinian Universities. From 1997 he is more and more involved – concerts, workshops, meetings – in his personal concept of collective conducted improvisation called “comprovisation”. Eventually he has been for seven years the artistic director of the Bottesini Bassofestival, dedicated – in the name of the double-bass virtuoso in his home town Crema – to every kind of “low-pitched” instrument in every kind of music. From 2000 he collaborates to the organisation of the festival “Mardi Graves” in Montpellier.